Apple again saw its sales and revenue grow in the third fiscal quarter of 2017, with $45.4 billion in revenue on strong iPhone, iPad and Mac sales. Following the news, the company held a conference call with media and analysts, and notes of interest follow. 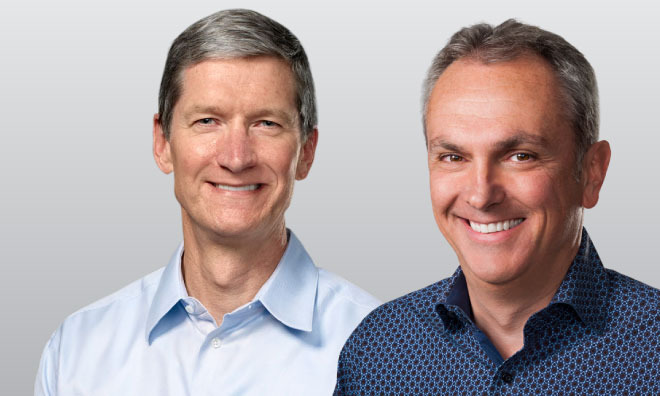 Participating in Tuesday's call were Apple Chief Executive Tim Cook and Chief Financial Officer Luca Maestri. Apple has surpassed 1.2 billion cumulative iPhones sold, and the iPhone 7 series continues to be a strong performer. iPad grew for the first time in 4 years, and U.S. education market sales of iPad were up more than 30 percent. Sales of Apple Watch were up over 50 percent in June quarter. Apple says it's the No. 1 selling smartwatch in the world. Apple ended the quarter with $261.5 billion in cash, 94 percent of it held overseas. Apple said the iPhone 7 is outperforming the iPhone 6s from a year ago, helping to drive sales and keep selling prices up. Many markets in Asia, Latin America and the Middle East grew sales by more than 25 percent, despite the fact that iPhone SE launched in the June quarter last year in many markets. iPhone ASP was up year over year, to $606, thanks to strong performance of the iPhone 7 Plus. When asked about WeChat in China, Cook said he sees Tencent as one of Apple's best developers. Upgrades for this fiscal year are the highest Apple has ever seen. The rate, however, is similar to what Apple saw with previous models, except for iPhone 6, which had an "abnormally high upgrade rate,' Cook said. Switching outside of China was up year over year. Apple achieved its highest global market share in over 4 years. NPD says iPad had 55 percent share of tablet sales in U.S. in June, and 8 of top 10 selling tablets. Purchase intent for customers planning to buy a tablet is more than 70 percent for iPad. Bank of America, Medtronic and Panera plan to roll out the 10.5 inch iPad pro through key areas of their organizations. Walmart will also be deploying iPad for employee training. Apple once again outpaced the larger PC market with growing Mac sales this last quarter. The company debuted new MacBook Pros, iMacs, and MacBook Airs at WWDC in June. Cook says the Mac is off to a great start in back-to-school seasonal sales. Services revenue was up 22 percent, to a record $7.26 billion. Maestri said Services growth was driven largely by the App Store. Apple says the iOS App Store outsells Google Play by two times. Apple sees revenue between $49 billion and $52 billion next quarter. It has forecast gross margin between 37.5 and 38 percent.